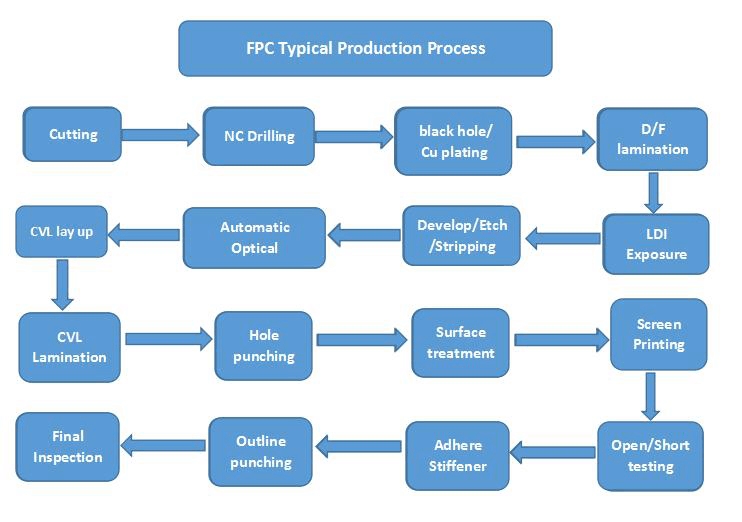 FPC, flexible printed circuit, which is a circuit board mainly composed of CU (Copperfoil), A(Adhesive) and PI (Kapton, Polyimide). It has many advantages such as space saving, weight reduction and high flexibility, which has a wide range of applications in production and life, and the market is still expanding. ED copper is inexpensive to manufacture but fragile, and the copper body is easily broken when bend or driver. RA copper is expensive to manufacture but flexible, so FPC copper foil is mainly RA copper. Acrylic and epoxy thermosetting adhesive. PI is Polyimide, which is called Kapton in DuPont, the thickness unit is 1/1000 inch lmil. It is thin with high temperature resistance, strong resistance to chemicals, and good electrical insulation. Single-sided copper clad laminate → Cut Lamination → washing, drying → drilling or punching → screen printing line anti-etching pattern or using dry film → solidify inspection and repairing → etching copper → etching resist ink, drying → washing, drying → solder mask, UV curing → screen printing, UV curing → preheating, punching and Form → open short circuit test → washing, drying → pre-coated soldering anti-oxidant (dry) or spray hot air flattening → inspection packaging → finished product delivery. Double-sided copper clad laminate → Cut Lamination → lamination → CNC drilling →inspection, burr cleaning → PTH → full plate electroplated thin copper → inspection,washing → screen negative Circuit pattern, curing (dry film or wet film, exposure, developing) → inspection, repairing → line pattern plating → electroplating tin (resistance nickel/gold) → resist ink(photosensitive film) → → etching copper → (DE-WETTING) → Clean → solder mask(adhesive dry film or wet film, exposure, development, heat curing) → cleaning, drying → screen printing, curing → (HASL) → Profile → cleaning, drying → open short circuit test → inspection packaging → finished product delivery. Reduce the size of the application product, save space, greatly reduce the weight, increase the effect, and reduce the cost. It has high flexibility and can be3Dwired, changing shape according to space constraints. Foldable without affecting signal transmission, anti-static interference. High temperature resistance and flame resistance. The chemical change is stable, and the stability and reliability are high. Provide more related solutions for related products, which can reduce assembly man-hours and errors, and improve the service life of related products. FPCs are widely used in commercial electronic equipment, car dashboards, printers, hard drives, floppy drives, fax machines, mobile phones, general telephones, notebook computers, cameras, video cameras, CD-ROMs, Hard drives, watches, computers, cameras, medical equipment, and other electronic products and equipment.